Software/Hardware Costs: For example, you might need to purchase a new authoring tool, some stock photography, or a new microphone. Development Time: Calculate development time by multiplying developer’s hourly rate by number of hours needed to develop the course. To calculate an hourly rate from a yearly salary, you can use this formula: salary / 52 weeks / number of hours in a workweek. Meeting and Review Time: Include the value of the time of everyone involved with the project: meetings with a manager, the tech department, your SMEs, copyedit, graphic design, etc. Calculate the dollar value of the time spent in meetings with these people as well as the time they devote to the project. Lost Production Time: The time your participants spend taking your e-learning course is called lost production time. 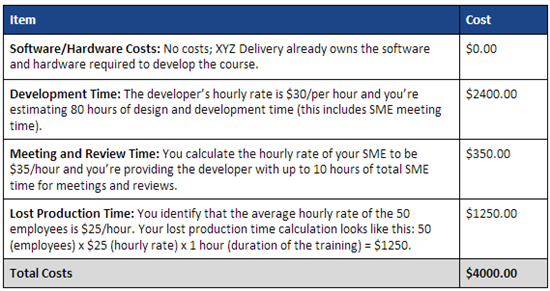 Calculate the lost production time using this formula: # of employees x hourly rate x # of hours the training lasts. These are some of the most obvious costs you need to consider. There might be others, such as organizational overhead and, the cost of setting up an LMS or webpage to host the course. Once you’ve identified and calculated the costs associated with developing and delivering your e-learning, you need to look at the second part of the equation: the dollar value associated with the benefits of your e-learning. The benefits of training can be tricky to identify and narrow down, but it is possible and very important to do so. To calculate the dollar value of the benefits, you need to identify 1) the specific task that is being taught in the training or e-learning, and 2) the average benefit, in dollars, of improving performance surrounding this task. Having flashbacks to math class? Let me share an example with you to illustrate this more clearly. You work for XYZ Delivery as a training designer. Over the past few months, an increase in shipping label errors has caused more packages to be returned undelivered. To reduce the amount of errors, the Shipping Manager wants to create a one-hour e-learning module for 50 employees on the proper way to fill out shipping labels. They ask you, their in-house training designer, to do a cost-benefit analysis for designing this module. Now that you’ve looked at the total costs, you need to identify the benefits of training the employees at XYZ Delivery on how to fill out shipping labels properly. The specific task being taught: How to fill out a shipping label. The benefit of improving performance for filling out shipping labels: You investigate and identify that, currently, the 50 employees get an average of one error each per week on shipping labels. An error on a shipping label means a package is returned at an average cost to XYZ Delivery of $15 per returned package. XYZ Delivery can potentially get an 800% return on their money in a year if they invest in this one-hour e-learning module designed to reduce the error rate for shipping labels to zero. It may make sense to leave room for a few shipping label errors—that’s only normal human behavior—so you could edit your calculation to reflect this. Again, this is just a general example to illustrate the cost-benefit analysis more clearly. 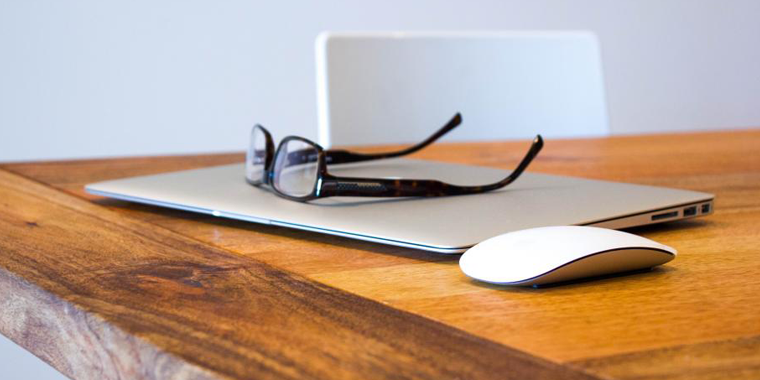 Hopefully this simple method for completing a cost-benefit analysis and calculating the ROI of your e-learning course will encourage you to do so for your next project. If you’ve done a cost-benefit analysis in the past and you’ve learned a thing or two that you’d like to share, please leave a comment below. We love to hear your feedback! Great article, Nicole! Even if your client doesn't use ROI to inform their decision, it's great to have for your own purposes. It becomes so much easier to justify your fee/job/project when you can show that your previous work had an ROI of 800%. Some other things to consider: - people don't tend to make mistakes when they're not working, you'll probably want to exclude holidays/vacation from any calculations based on hours/days/weeks of work - don't forget to plan for maintenance/obsolescence: it's harder to attain (and maintain) a positive ROI if your course is only current for a year as compared to a course that stays relevant for a decade - as your audience increases, so does the potential ROI (think economies of scale). For example, a 5% cost savings for each of 5 employees may not be worth your effort, but the same 5% across 5 million employees adds up to "real money" Andrew, you bring up a good point. When you're dealing with potential gains/losses it gets trickier. Without getting too bogged down in the math (that's what actuaries are for), I suppose you could look at the average cost of a breach in terms of settlements, fines, lost business and reputation damage. If you've had incidents in the past (hopefully you haven't! ), you could use those numbers, e.g. "Last year, breaches involving mishandling of personal info cost us $5M."